Climbing into an ugly little compact car with crank windows and a radio stuck on an AM talk station after being crammed into an economy plane seat just makes travel that much sadder. But just as we always try to upgrade to first class whenever possible, we’ve finally taken our rental car experience to the highest level possible. Silvercar launched a few years ago, but so often our travels don’t require us to have a car thanks to Uber or those Ab Fab occasions where we have a private driver and a chilled bottle of champagne. 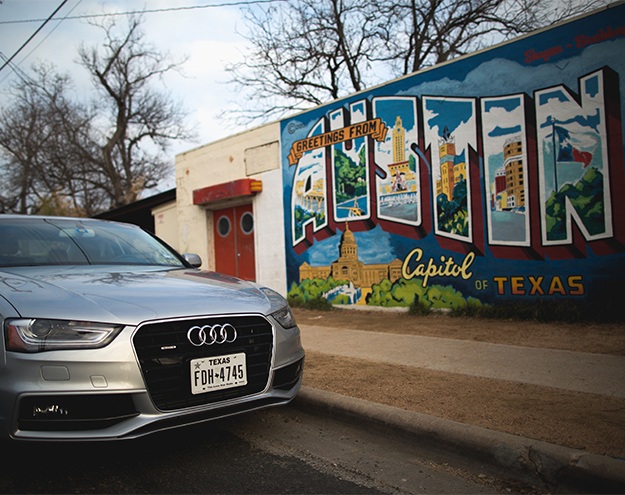 Once we had the need, however, Silvercar was already at the top of our list. And now, we’ll never use another rental company again. Their business model is simple. Only stock silver Audi A4s and make the process as convenient and friendly as possible. It goes something like this: Download the app for iPhone or Android and reserve your car. Get on the plane at some point. Fly. Try to make the flight attendant laugh. Flirt with the guy in line for the lav. Land. Flag down a motorized cart. Grab your luggage. After you leave baggage claim, head to the Silvercar lot where your smartphone unlocks the trunk and doors after a quick QR code scan. That’s it. You’re ready to hit the road in grand style. The rate (from $49 – $99 per day depending on location, day and demand) includes free GPS, satellite radio and in-car wifi. When you return the car, they fill up the gas for you and charge you the local rate (plus a nominal $5 fee), not some outrageously inflated “convenience rate” of other companies. We never thought we’d fall in love this hard again. And we definitely didn’t think it would be with a car. Putting some gay in your day from all around the country.